Unblur images in Photoshop Sneak Peak | Shelby White - The blog of artist, visual designer and entrepreneur Shelby White. This is impressive. I can’t even imagine the processing that gets done behind the scenes on a feature like this. 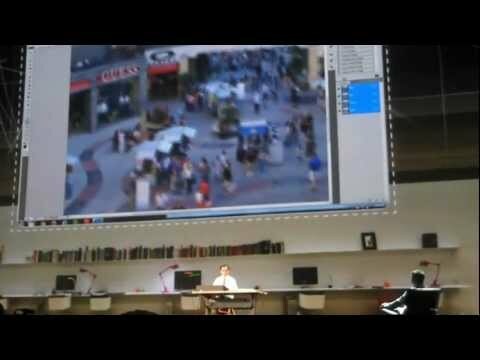 This feature—though not promised in the new Photoshop spec—was demoed at the Adobe Max 2011 event hosted by Rain Wilson. We’ve all seen hard-to-believe examples of photos being blown up and zoomed on shoes like CSI, but this would make a lot of that possible on a consumer level. I think this feature would be used quite a bit more than the previous “mind-blowing” Content-aware scaling. Also, did you happen to see that the guys were sitting in Eames Lounge chairs? I seriously would use this. I hope that they implement this in the next Photoshop spec. You mean this will be better than Filter> Sharpen then Cmd + F F F F F F !! Note that this is only for fixing motion blur, I would imagine they’re using Wiener deconvolution and some sort of sharpening. The data still has to be in the image, it just puts it back in its correct place.